Caterpillar Skip Loader Tires: Caterpillar is the first name most people think of when it comes to heavy equipment, although CAT only made one skip loader the 414E, it is a favorite among contractors and homeowners. 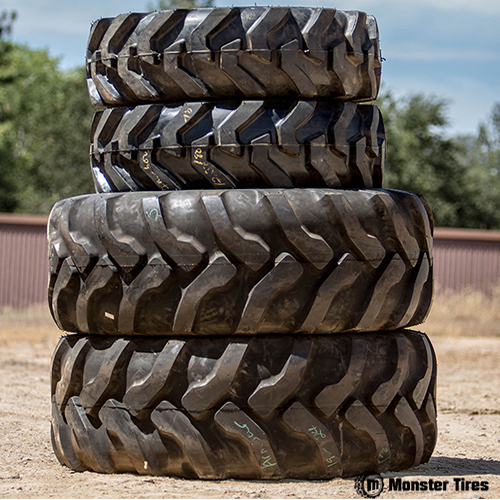 When it comes to replacing your CAT Skip Loader Tires, Monster Tires should be your first and only stop. We offer unbeatable prices, turnaround time and customer service for Caterpillar Skip Loader Tires. Since CAT no longer makes the 414E Skip Loader, make the best of yours and replace your tires today! Dependability and Reliability with Monster Tires. When the tires on your Caterpillar Skip Loader wear out, you need to get them replaced immediately and with the best tires you can get. The better quality tires you have on your Caterpillar Skip Loader, the longer they will last and the safer your work site will be. At Monster Tires, we have the Caterpillar Skip Loader tires you need, including 414E Skip Loader Tires. Whether you need to replace your Rear Tire Set for Caterpillar Skip Loader, you need a Front Tire Set for Caterpillar Skip Loader, or you need to replace a full Tire Package for Caterpillar Skip Loader, we have what you are looking for! First Class Service and Staff Support. Perfect customer service is our goal at Monster Tires. We aren’t just here to give you great Heavy Equipment Tires to get your piece of equipment rolling again. We are also here to answer all your questions and make sure you are getting the tires you need for your Caterpillar Skip Loader. We have High Quality OTR Tires for construction companies and home owners. Trust in Monster Tires for your next set of Caterpillar Skip Loader tires!